Welcome to the Asian Summer Study Program 2012! CLICK ON A PROFILE PICTURE to see each member's blog. Feel free to check out their Asian journey in South Korea and China and experience everything with them! Lee is a former primary school teacher who now teaches future teachers at Lander. As a professor, he is active in helping teachers to see themselves as leaders both in their classrooms and as advocates for their students in the public arena through service learning and professionalism. He is also an active world traveler. The past few summers he has taught in a primary school in Guatemala. In his free time, he loves to read, play tennis & golf, and listen to music. He plays guitar and sings. He is not shy around the karaoke mic. Boyoung is a Korean native, and has lived in the US for three and a half years. As a newly recruited member of the Office of International Programs, she takes care of cultural and educational activities and opportunities for international students, such as: the Friendship Family Program, Culture Exchange and more. She explores study, travel, and teach-abroad opportunities in Asian countries such as South Korea, Japan, China and Thailand. She loves learning different languages, which is why she's currently building up on her Spanish and Chinese. She enjoys Pilates, Zumba, and outdoor activities for her leisure time. She’s trying her best to make this once-in-a-life-time experience more worthy and efficient for our delegation members. Ivy teaches Introduction to Art Concepts and Graphic Arts in the Lander University Art Department. She has a background in visual arts with a BFA from Clemson University, MAT from Lander University as well as experience as a Non-profit Art Gallery Director and Program Coordinator. Having grown up in the small town of Due West, South Carolina, Ivy loves antique malls full of country styles. Decorating her home and life with items of visual appeal is a passion of hers. You can find her on any given afternoon working in her backyard studio on such things as woodblock printmaking, fabric arts/fashion clothing and even making the occasional stuffed animal. My name is Lauren Corbitt. I am originally from Greenwood, South Carolina, and I am a Spanish Instructor at Lander University. I have lived and studied in Japan, but this will be my first experience traveling through Korea and China, and I am so excited to have this wonderful opportunity to be a part of this trip. My name is Grace Contreras, I am currently working at Erskine College Art department and Education Departments since January 2012 to present as Adjunct Professor and Piedmont College Art Adjunct Instructor and Lander CE photography teacher. I earned my Master Art Teacher Graduate degree; Studied K-12 earned my state Certification in Art Education at Lander University. Earned the AP Advanced Placement certification from SCAD in Atlanta GA. in 2011. I earned my undergraduate degree in Psychology/ counseling and a minor in Art History in 2009 from Lander University. I earned my Master Life Coaching certification MCC in 2006. Originally from Tucson Arizona, recruited and relocated to SC in 2001 working with Families in Crisis as a Life Coach. Lives in Abbeville, South Carolina and I am a mom and an active Lander University Alumni member; I embrace Cultural Studies, promoting acceptance in diversity and peace, I am a world traveler. In my free time, I love to volunteer in my local community with Habitat for Humanity, travel and volunteer to promote the arts, attend art museums, art conferences, play golf, go to day spas hang out at Star Bucks and just be with my family and friends. I earned Study Abroad credits in Art History, Psychology, and Advanced Photography traveling to England, Egypt & Greece in 2008, traveling to Italy in 2009 Ireland for Advanced photo landscape in 2010 and excited to visit China and Korea 2012 with Lander University. My name is Paizley Ballenger and I am a sophomore CIS/Engineering major, math minor at Lander University. I was raised in South Carolina and have lived here all my life. I have never been out of the country and am very excited about being able to go on this trip. I have always wanted to travel to Asia and experience the life and culture that it has to offer. Thank you Lander and all their sister universities for giving me this opportunity to expand my mind and make life lasting memories. Hi! My Name is Ashlin Crout! I’m a freshman majoring in Mass Communications at Lander University. I’ve lived in Greenwood, South Carolina for about nine years now; it’s a really small town,so there’s not much to do here, you pretty much have to entertain yourself. Luckily, I have a lot of family that lives in Greenwood with me; I live with my mother and my older brother and my grandparents live about five minutes away from me. I enjoy reading, writing, and playing with my dog Remy. He only plays when he wants to though; he’s super lazy, which is weird because he’s only four years old. I don’t think I’m very interesting, so it’s kind of hard to list any fun facts…hmmmm, well, I’ve broken my left arm twice, the first time I was roller blading and the second time I think I tried to fly. Needless to say it didn’t turn out too well. One of the reasons I want to go to Asia is because I've never been out of the US, but the biggest reason is because I’d like to one day work internationally so I need to be comfortable in different cultures. I’m also fascinated by Asia, I’m really looking forward to learning as much as I can :-) ! This former “Jersey girl” is now a proud resident of South Carolina. Jessica is the youngest of four children and a member of a big, rambunctious, and loving family. Her time thus far at Lander University has been rich in compelling courses, attaining new knowledge, and personal growth. Jessica enjoys volunteering, yoga, traveling, cooking, and most importantly spending time with family and friends. She is a strong believer of intercultural relations and advocates diversity. 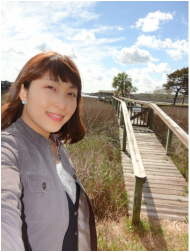 She anticipates experiencing Korean and Chinese culture, trying new foods, and visiting historical landmarks. The Asian Summer Study program will enhance Jessica’s overall college experience, and add to her lifelong memories. Hi my name is Joshua de Leon. I’m from Sumter, South Carolina of the United States of America. I’m a 19 year old 1st year student at Lander University and I’m working on a dual degree in Biology and Computer Information Sciences. Asian history and culture are a passion of mine, so this trip is a dream came true. I look forward to everyday of this trip and to end it with a deeper understanding of the Asian world. Hi! I'm Rachael Stansfield, a freshman at Lander University. I am originally from Florida, but have moved a considerable bit and my current home-town is Columbia, SC. Animals are definitely a passion of mine and for that reason, I am majoring in Chemistry so that I can later specialize in Animal Genetics. As for pets, I have a variety of fish, a horse, three cats and a dog. What drew me to join this Asia trip was curiosity more than anything else. I'm always curious about learning and experiencing new things. I look forward to meeting you all!